The Bible does not explicitly command Christians to join a church - it assumes it. The New Testament presupposes membership, for example, in the command, "obey your leaders and submit to them, for they are keeping watch over your souls, as those who will have to give an account" (Hebrews 13:17). If you never join a church it is impossible for you to obey this command. Similarly, I Peter 5:2 directs elders to "shepherd the flock of God that is among you, exercising oversight." How can elders identify the particular flock that God holds them responsible to shepherd unless Christians formally align themselves with particular congregations? Suppose John Smith attends First Presbyterian Church for three years but never joins. Then he starts attending Elm Street Baptist Church but, again, does not join. After attending Elm Street Baptist for six weeks, is John now the under the pastoral care of the elders at Elm Street Baptist or the elders at First Presbyterian? How can the elders of a church know whom they are charged to shepherd apart from congregants taking vows of membership? 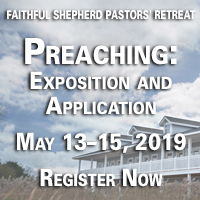 How can elders know when they are released from their responsibility to shepherd an individual unless that individual informs them that he or she has made a formal commitment to another church? This may not seem like a big deal to some people, but it is a serious issue for conscientious elders.